Assuming you already configured both your LAN and WAN interfaces, it should be clear which interface to choose for the extra port. Apparently, I can't read and didn't read the small print at the bottom. I forgot to add the proper firewall rules to make it work. Go to Firewall->Rules, click on the new interface tab and configure appropriately. To make it exactly the same as your LAN, change the source to <interface name> Subnet. This is a somewhat short tutorial. 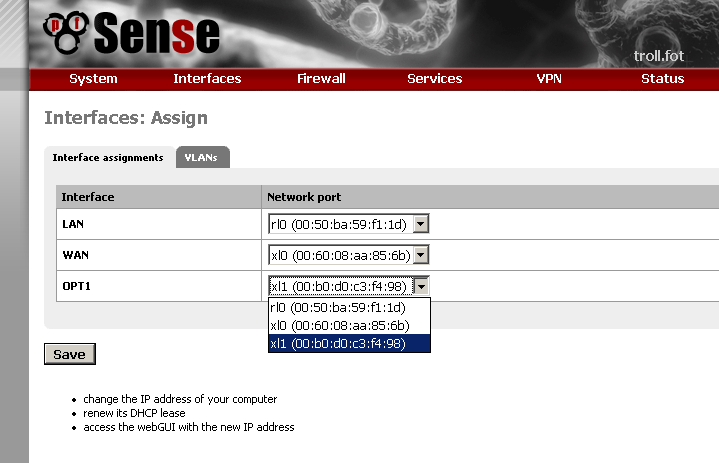 If you're using pfSense, you're probably already know what you're doing. Now I can eliminate the switch I was using and go directly to the router.